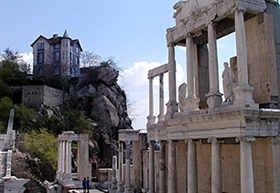 It is a world-famous fact that Plovdiv is among the oldest cities in Europe ? a contemporary of Troy. In 324 B.C., Philip II of Macedonia invades the Thracian city of Eumolpia, borders it with solid castle-walls and names it Philippopolis, ?the city of Philip?. Philippopolis becomes the centre of the Roman province of Thrace and it hosted all the administrative institutions. The Roman-time City Council was called ?Odeon?, or also ?Bulevterion?. Ms. Maya Martinova-Kyuleva, an archaeologist and executive manager of the excavations of the Plovdiv Odeon, was so kind to give an interview for the Plovdiv Maritsa newspaper. According to her, very soon, as a result of thirty years of hard research, the whole ensemble of public buildings connected to city?s administration as well as its Roman-times cultural and religious life will be exposed. The excavation site has the size of 20 decares. The Forum complex was exposed in 1972, at the time when the Plovdiv Central Post Office was reconstructed, and a part of it goes under the buildings on the Main Street. Nevertheless, a significant part of the ancient building is well preserved and it will be exposed just as it used to be some 16 centuries ago. The entrance of the Odeon is from today?s Gurko Street. The visitors will go in by two staircases ? one inside the very building, the other one in the very porch, among the columns. There findings illustrating the style of living from the 1st until 4th century A.D. ? artifacts of glass, metal, ceramics, copper, terracotta, clay utensils and silver Roman coins?